Manchester United boss Louis van Gaal says Anthony Martial and Wayne Rooney are among six players who will miss Saturday's trip to Watford. Martial, 19, was injured in France's friendly international against England on Tuesday, while Rooney is ill.
Michael Carrick, injured in England's friendly against Spain, joins Marouane Fellaini, Antonio Valencia and Luke Shaw on the treatment table. Van Gaal said striker James Wilson is not fit to play 90 minutes. United have been accused of lacking flair this season, and have scored the fewest goals of the Premier League's top seven teams. They also have the meanest defence in the division. 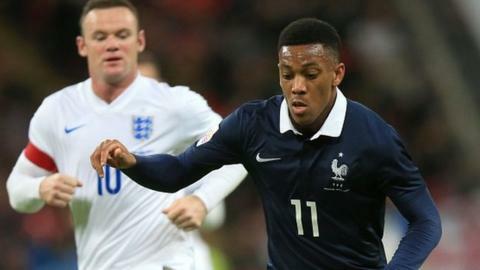 Martial also played in France's international friendly against Germany at the Stade de France last Friday, a game which was targeted as part of the Paris attacks. Three people died outside the stadium, among 129 killed in separate attacks across the city. Van Gaal said France international Morgan Schneiderlin and German midfielder Bastian Schweinsteiger, who both played in the game, are available for United's game on Saturday, which kicks off at 12:45 GMT. But he added he was unsure if they would play: "They can play, if we don't take into account this event which has happened." Schweinsteiger later said on social media: "Back in premier league mode." On the Premier League's decision to play La Marseillaise before games this weekend, he added: "We as a member of the sport of football cannot do too much - we can give support in symbols and this is a nice thing for the French people, the victims, their relatives to give them force and strength to survive." The United boss also said that Carrick's ankle ligament injury was not serious. "He shall be playing much quicker than everyone has written," the Dutchman added.